Oil on board, 5"x 7"
This one is great Don. 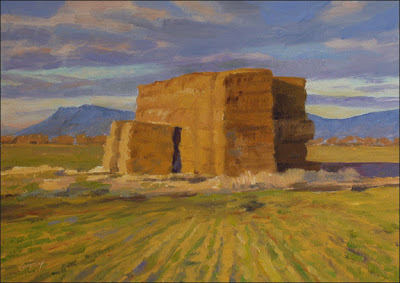 The man made lines and bales contrast well with the natural shape of the mountains and clouds. I like those colors. You have such a wonderful touch with that late afternoon light. Just perfect. Thanks for the encouraging words, Frank. Suzanne, good to hear from you--thanks. I agree with Suzanne-- my first thought was 'monumental'! Kind of like a recreation of Uluru, in hay. I'll admit you sent me to Google with "Uluru,"Jason, but when I saw the name "Ayers Rock" I knew what you meant. I don't think my hay can stack up against the rock (sorry:)but I appreciate the compliment.